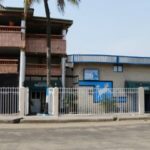 Claim "Eleshin Dudu Hotel and Suites"
Ever been at Eleshin Dudu Hotel and Suites? Write a review!!! Each room has air-conditioning, an en suite shower and a TV. Guests can order a variety of meals and drinks from the onsite restaurant and bar. Laundry service and car-hire are available at an added charge. The premises are guarded by security personnel and ample onsite parking space is available.